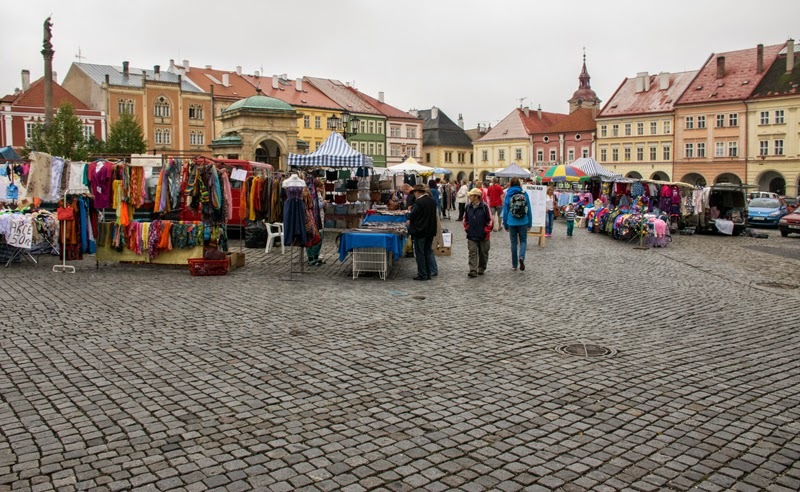 I headed out early from Brno to my next destination: The Bohemian Paradise, or Český ráj. 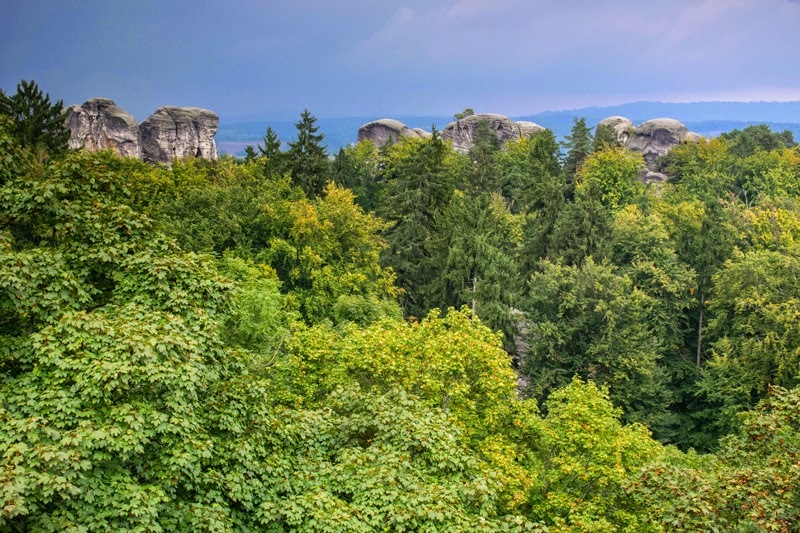 This is nature reserve about 2 hours northeast of Prague and is known for its bizarre sandstone formations (Rock Towns) and the castles that sit upon them. 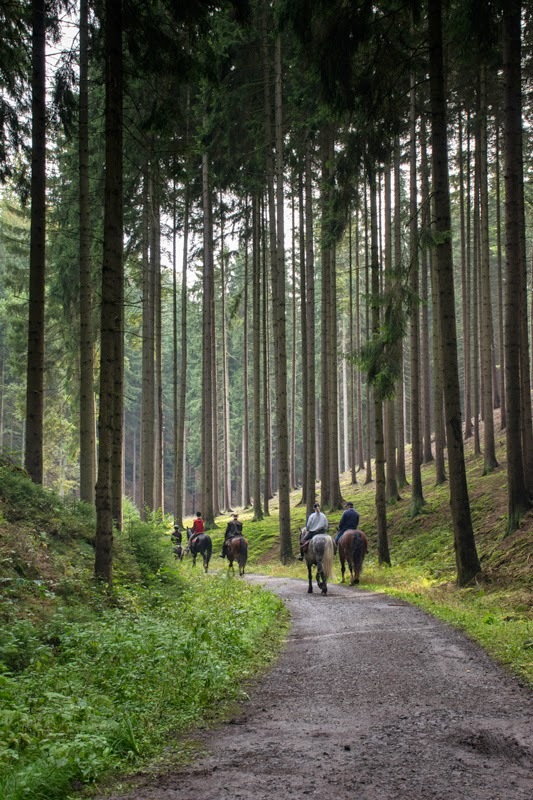 There are nearly 70 square miles of hiking trails in this micro-region of Bohemia. 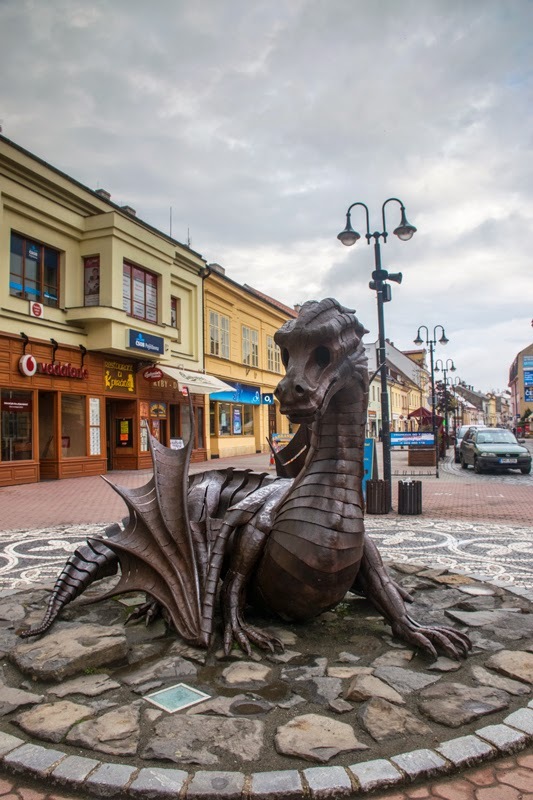 I arrived in the town of Jičín a bit after noon. Jicin, in the 1600's, was built up by General Wallenstein (see previous post about Wallenstein Palace). He turned the town into the capital of his duchy of Frydlant. He founded a hosptial, college, and mint here. He also had further plans, like building a university, but was assassinated before those plans could be put into motion. 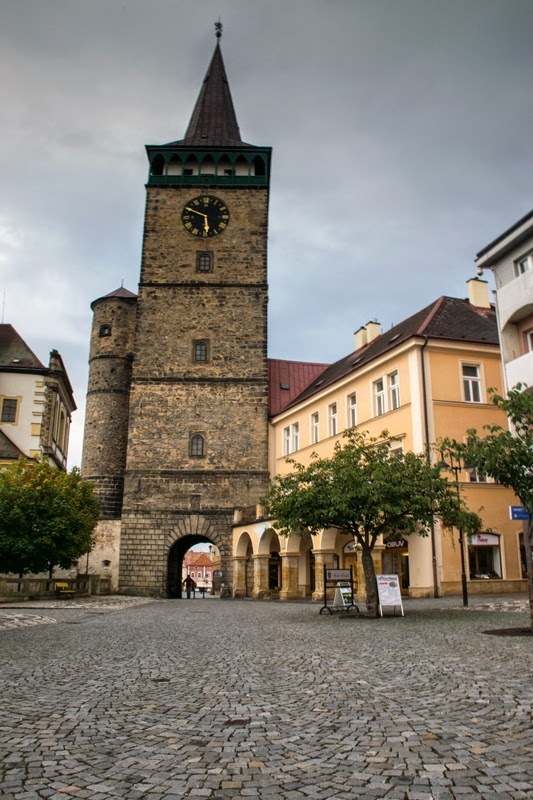 Jicin is also noteworthy because it was here, in Wallenstein's Chateau, that in 1813 Emperor Franz I of Austria, Tsar Alexander I of Russia, and Friedrich Wilhelm III of Prussia formed the alliance that would eventually bring to defeat to Napoleon. Valdicka Brama, the entrance to the old town, dates to the 1500's. 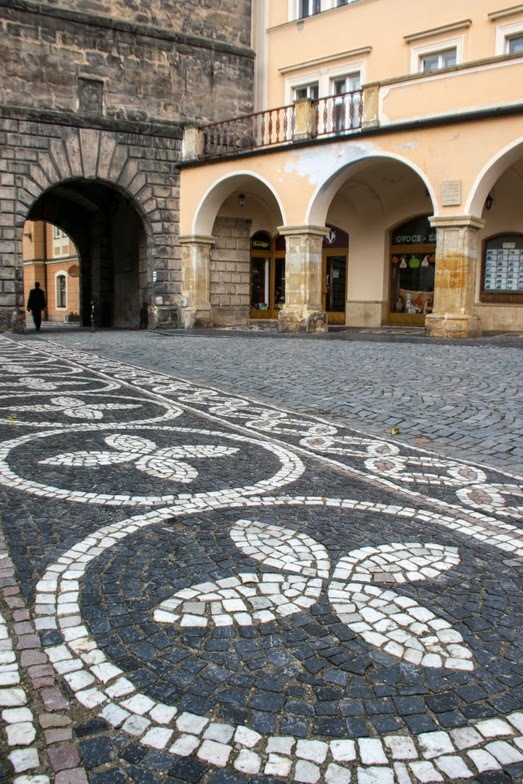 The amazing cobblestones of Jicin. My feet would soon rebel at walking on such beauty. It might be aesthetically pleasing but it hurts walking on them after a while. I was in constant amazement at women in high heels navigating cobblestone streets with ease. 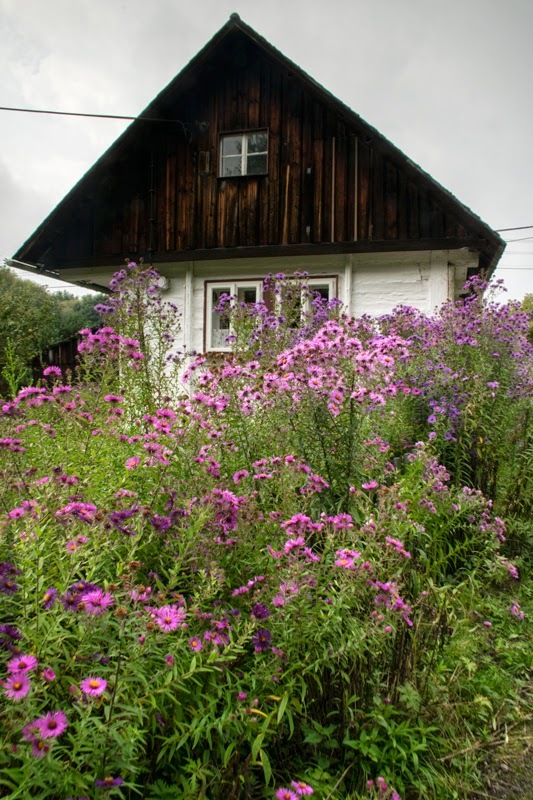 I was staying in a nice pension called U vsech certu. And this is where my trip takes on an unintended theme and turns into a trip to hell and to the executioner, then includes a meeting with a practitioner of the dark arts, which leads to eating pork hocks with the devil. Before you think I've lost my mind "vsech certu" means hell in Czech. Thus I was staying in Hell at the foothills of the Czech Paradise. I found this funny in a Dante Alighieri and Milton sort of way. Actually, the devil is a trickster character in the Czech Republic and is not the hellfire and brimstone and damned to hell kind of devil that some people embrace belief in. He pops up a lot here in unexpected places. As for the executioner, the practitioner of the dark arts, and the devil...well, just keep reading this blog and you'll find out. My first act upon dropping my bags in the very comfortable and nice room (number 7, one of my favorite numbers) was to make the five minute walk into the center of town to buy food and water. Jicin has really amazing cobblestones and a lot of second-hand stores. Then I walked back to the pension and slept like the dead into the early evening. I would wake up long enough to enjoy some really good food in the pension's restaurant. The mushroom soup is amazing. 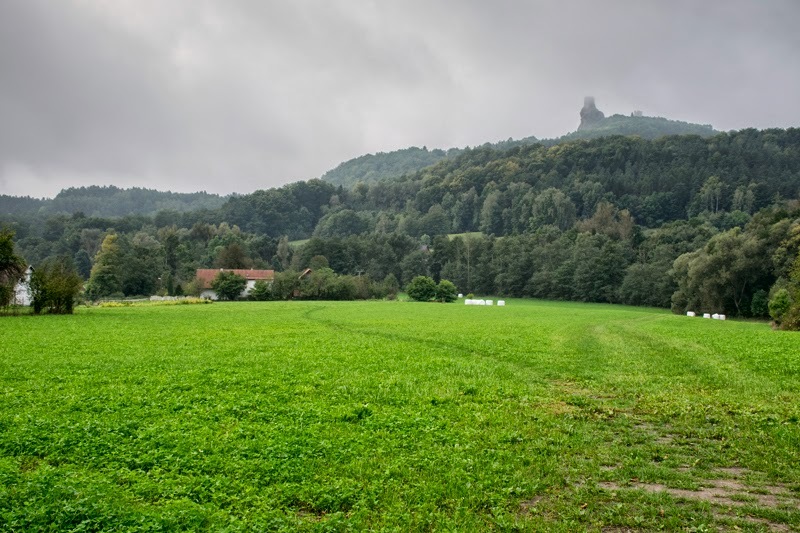 This day I intended to hike from Trosky Castle to Hruba Skala, and then all the way to Turnov but the weather would thwart me. 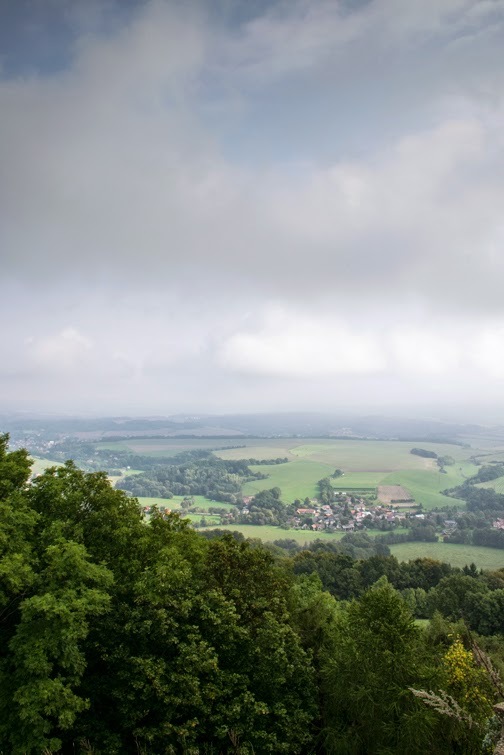 I took the train (just two cars) from Jicin to the tiny village of Ktova and began hiking up to Trosky Castle, which broods over the entire region, haunting the hills up on its high double perch. 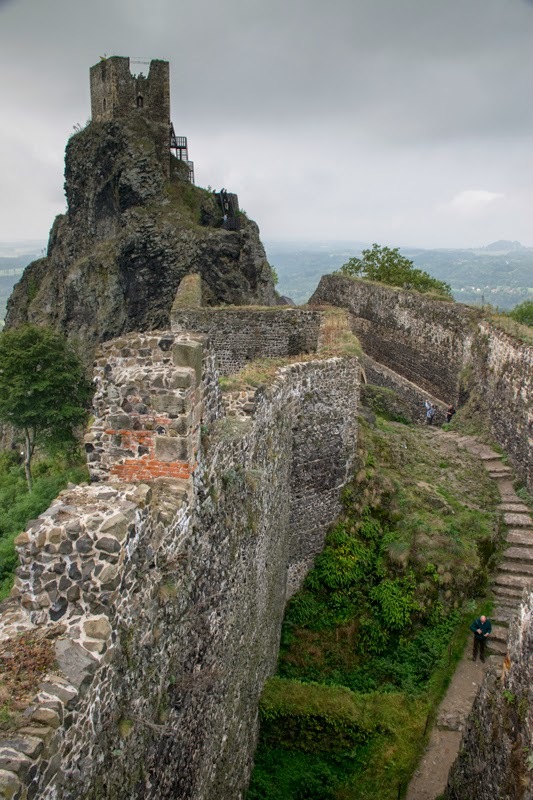 Trosky is one of the most famous castle ruins in the Czech Republic. It sits straddling two volcanic plugs and is characterized by its two towers Baba (Old Woman) and Panna (Virgin). 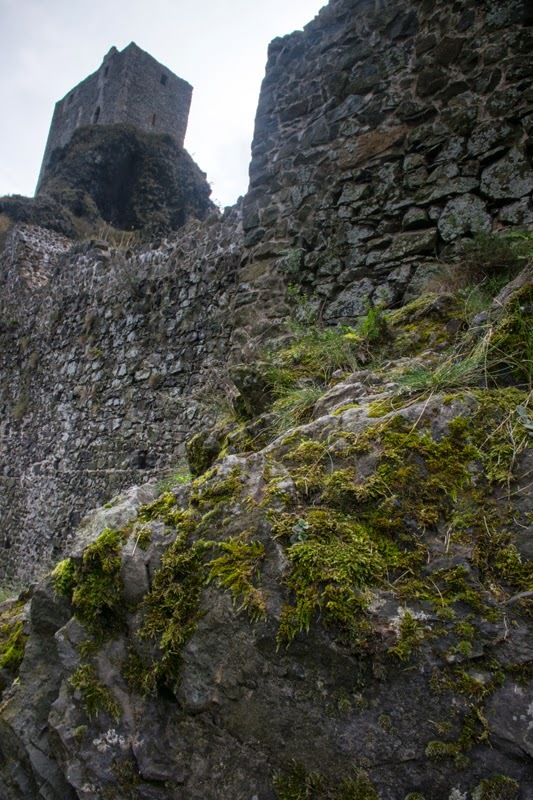 The castle dates the the 1300's. 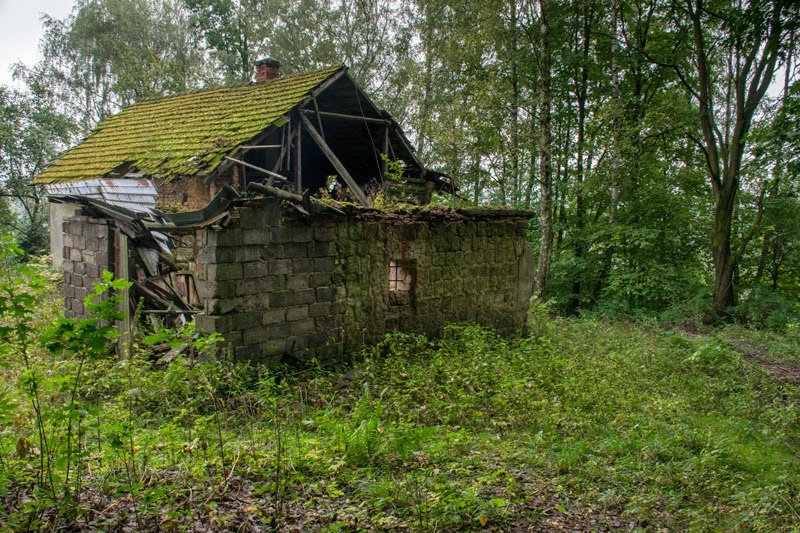 It was left in ruins after the Thirty Years' War. Trosky Castle looming in the distance. Trosky Castle. 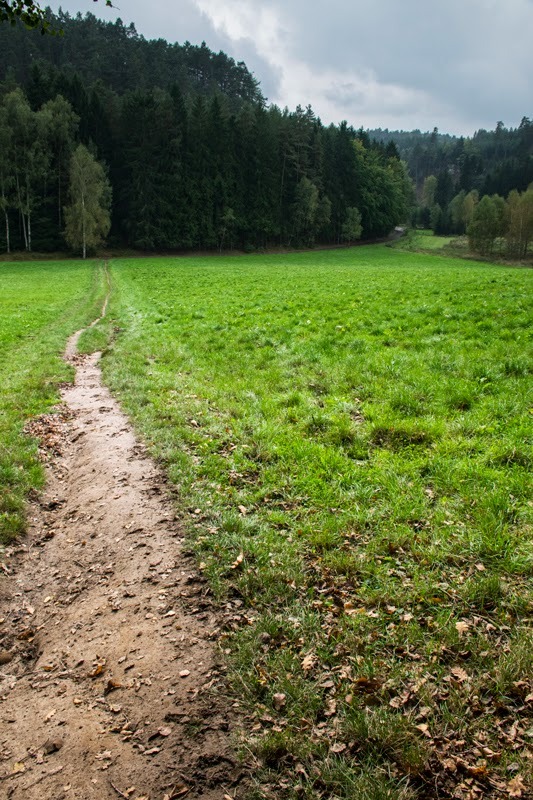 You can see the trail cut through the field. Falling apples were a constant hazard on this trip. 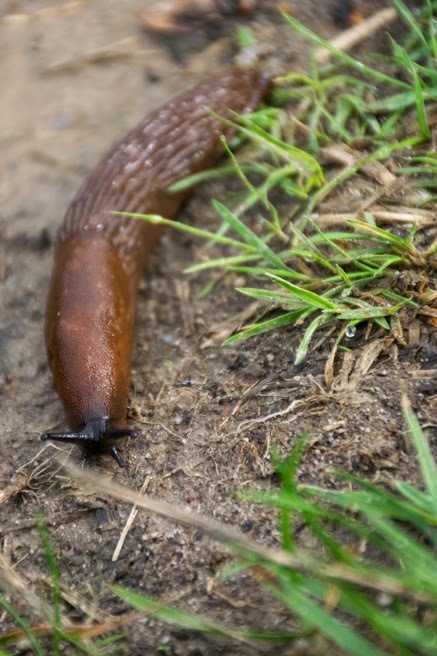 Slugs like the damp weather. I spent a lot of time trying not to step on them this day. Abandoned building, getting closer to the castle. 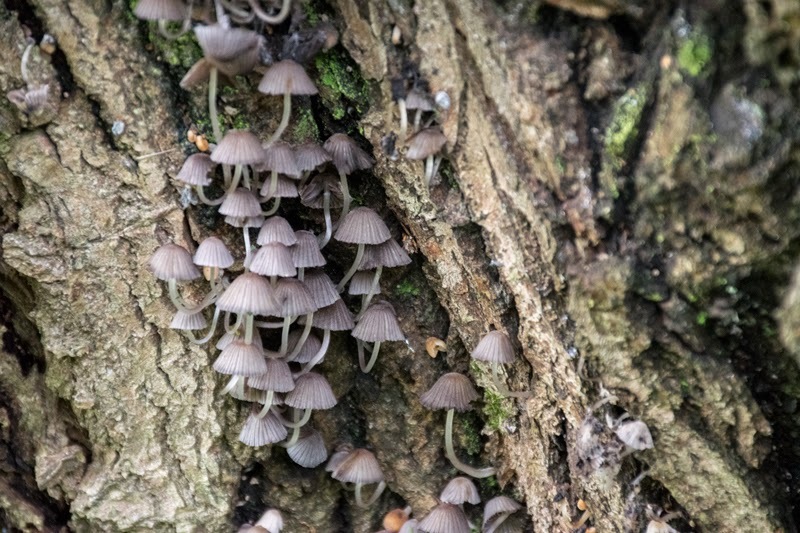 Mushrooms were everywhere, in myriads of forms. 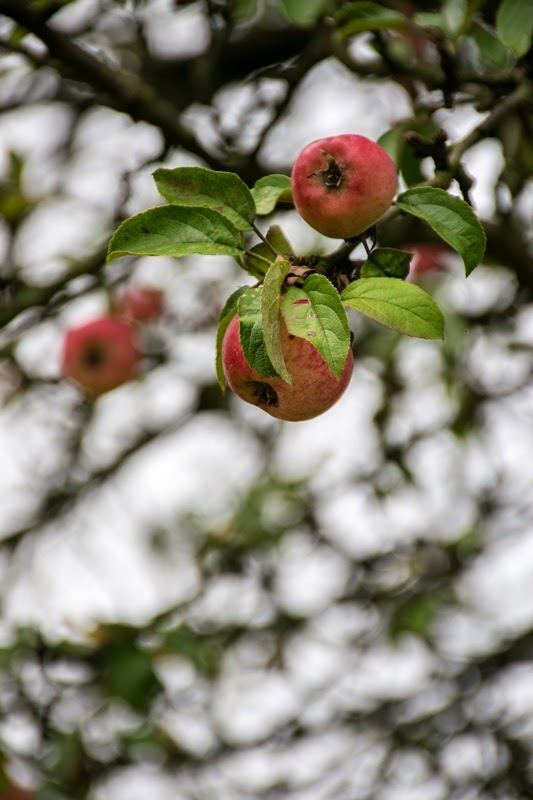 It's a hell of a climb up to the castle, through farmer's fields, orchards, and thick woods. It was damp and humid out, the sky ever threatening rain. Slugs, snails, and fallen apples lined the trail. The humidity made the climb uncomfortable but it was well worth putting up with the conditions once I reached the castle. Inside the ruin there are a lot of stairs to climb but the view of the surrounding area is amazing. For some reason the place was crawling with fellow hikers, all with tiny little dogs in tow. Trosky overlooking the Cesky raj. 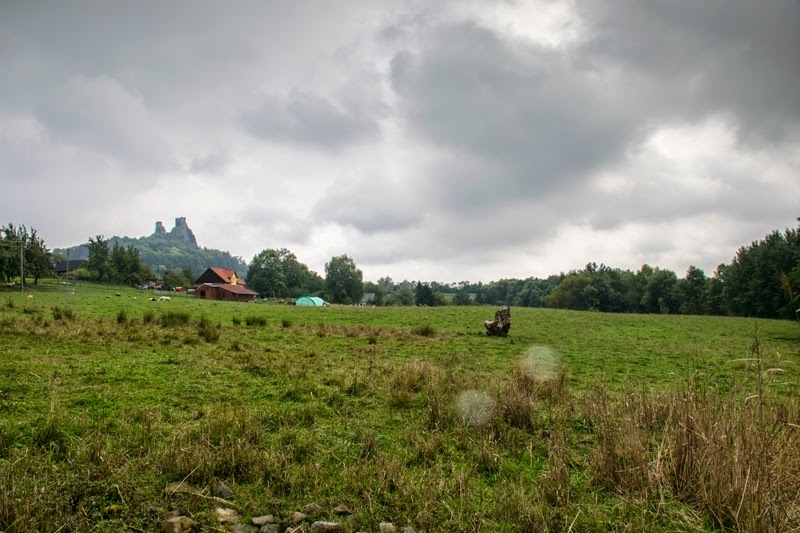 After climbing around the ruins for a while I stopped first at the restaurant near the parking area to refuel, then headed out on the red trail toward Hruba Skala and the Hruboskalso rock town. 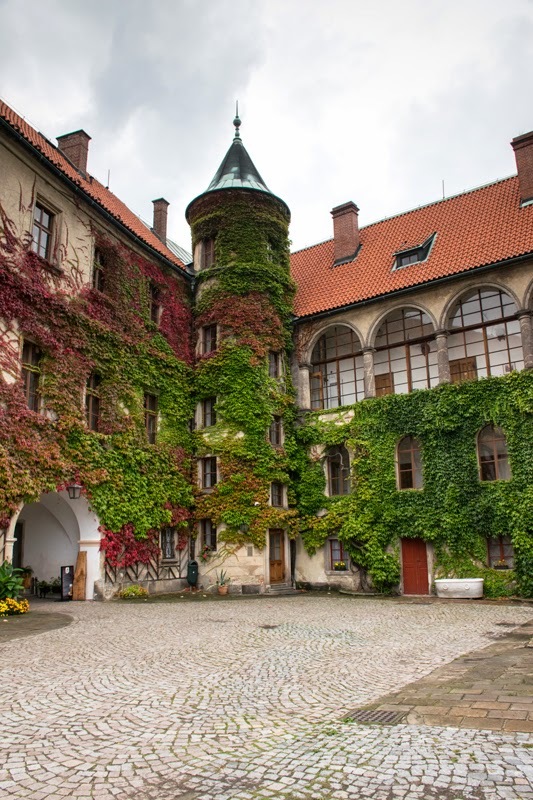 Hruba Skala is another castle or palace, that also dates to the 1300's. It now functions as a hostel, hotel, and restaurant. 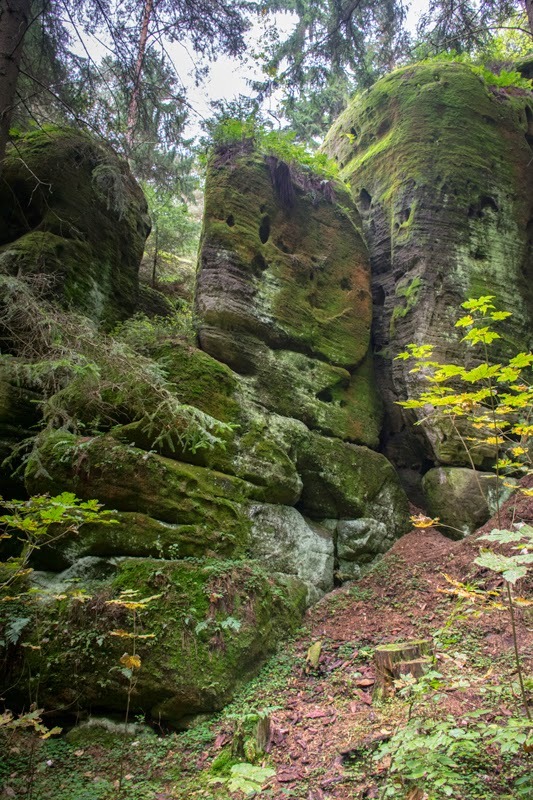 It sits high upon sandstone cliffs. Another view of the two towers of Trosky Castle. 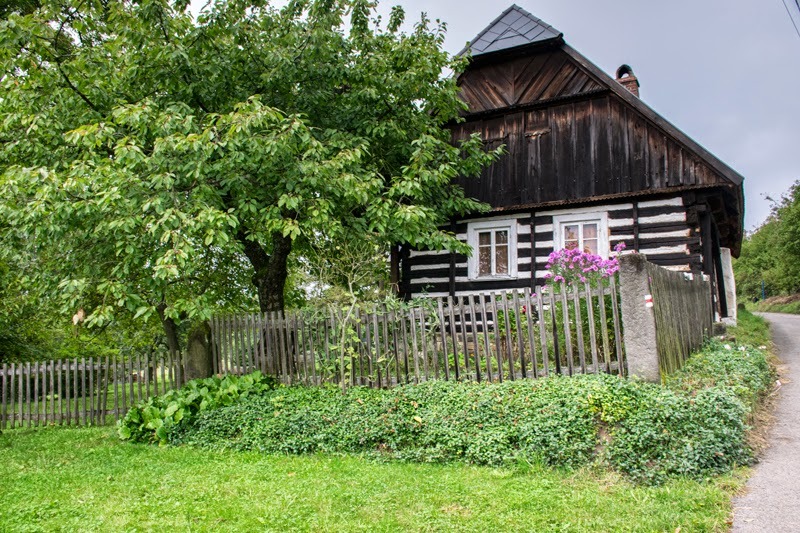 Example of the traditional wooden, black and white striped wooden house. 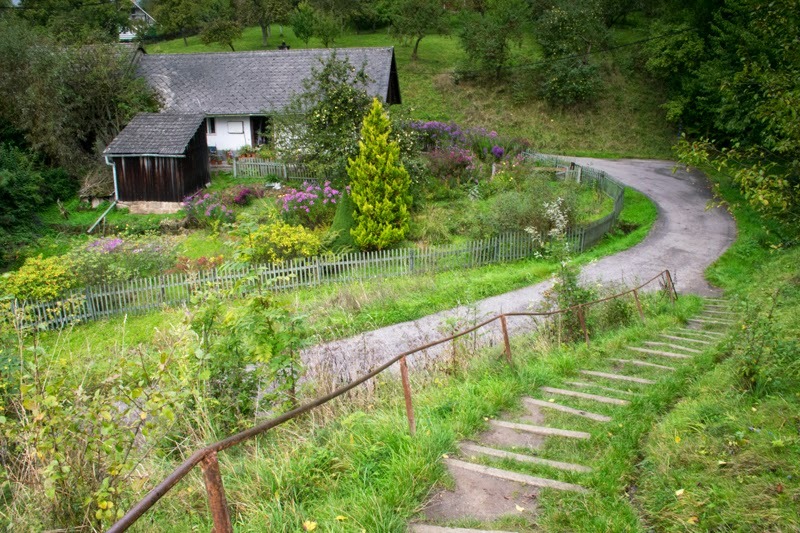 Looking back through the hamlet of traditional houses/farms. Trosky still looms in the distance. 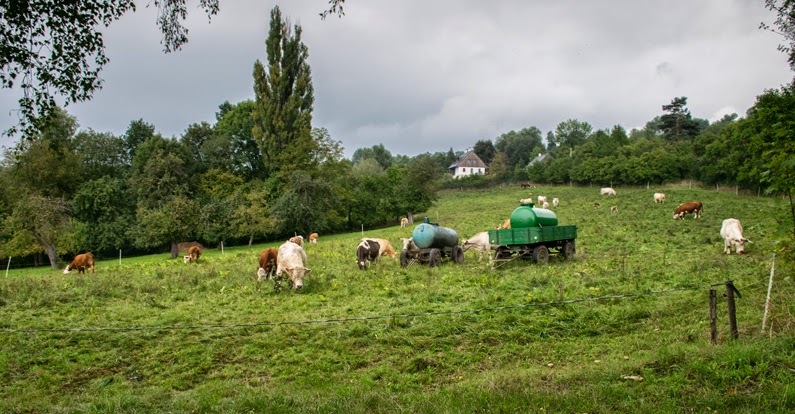 I walked through tiny hamlets consisting of traditional Czech houses (black wood and white stucco in stripes), walked past fields full of lowing cows and baaing sheep, and then through thick forest, the tree tops so very high above my head. Mushrooms and slugs lined the trail. 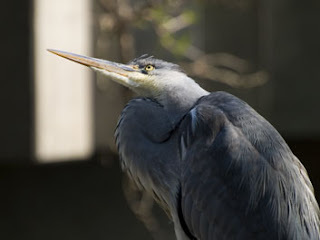 Great Spotted Woodpeckers and other birds flitted through the high branches of the forest. 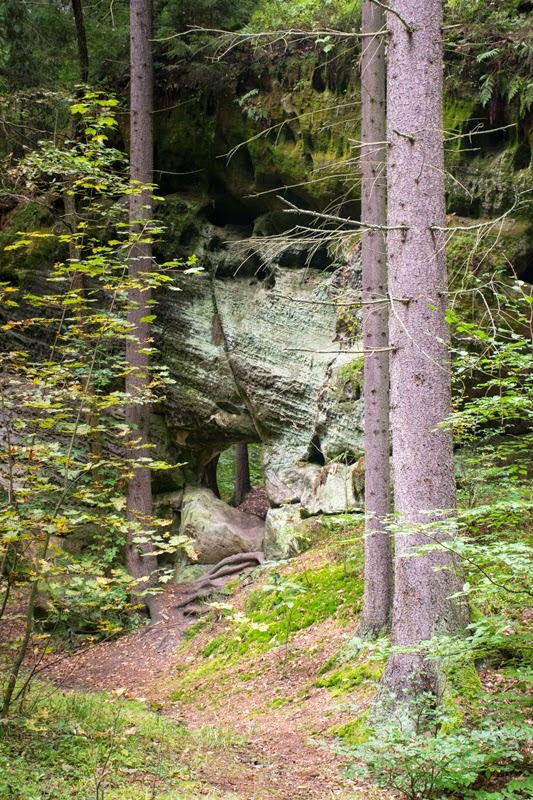 Through the trees sandstone formations began to appear, full of hobbit holes and covered with electric green glowing moss. I followed a couple out mushroom picking for a while and then was passed by a group of hikers, all hiking barefoot. 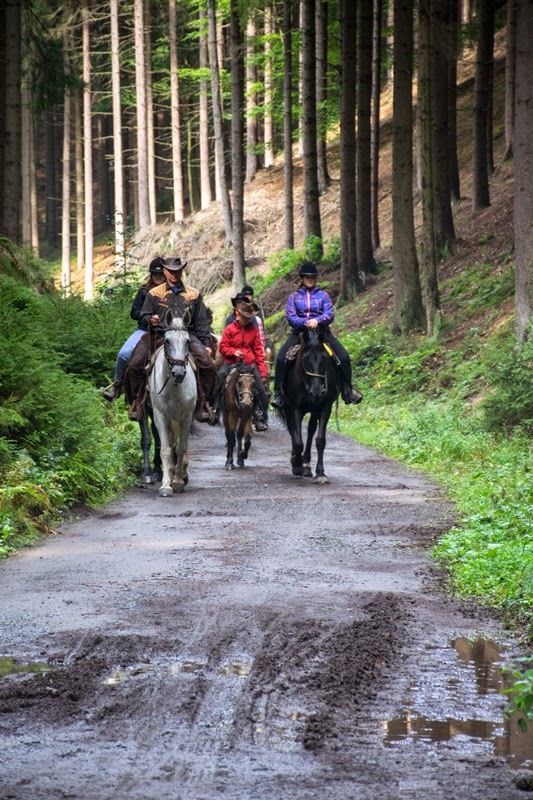 Then seventeen Czech cowboys on seventeen Czech horses passed me. This is when I adopted a new hiking philosophy: If a horse can handle the trail then so could I. This would keep me from ending up somewhere where I just could not physically handle the climb or descent. A portal through the sandstone. 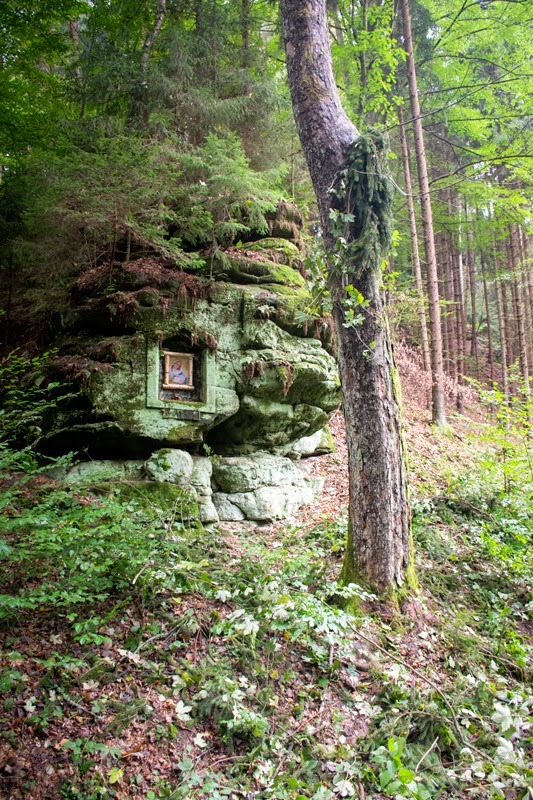 Shrine cut into the living rock. 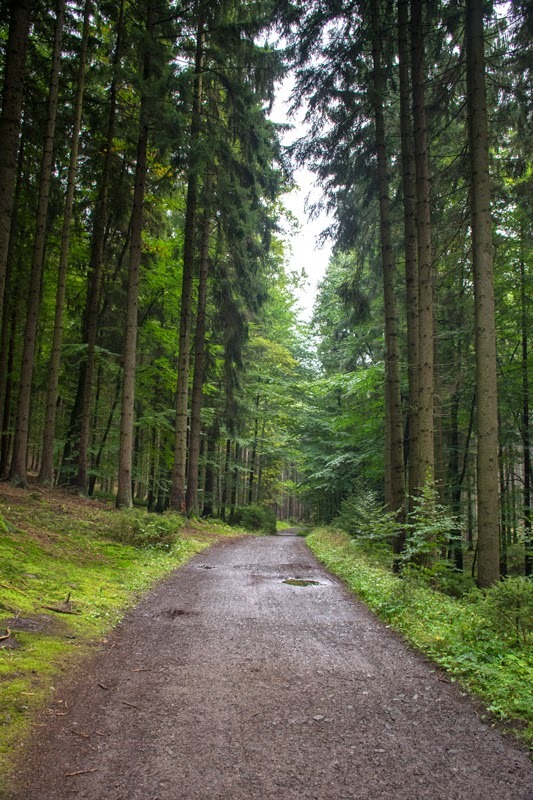 The forest and the Red Trail. I end up standing in the huge puddle of mud off to the right (out of frame) in order to make room for all the horses. Seventeen in all. 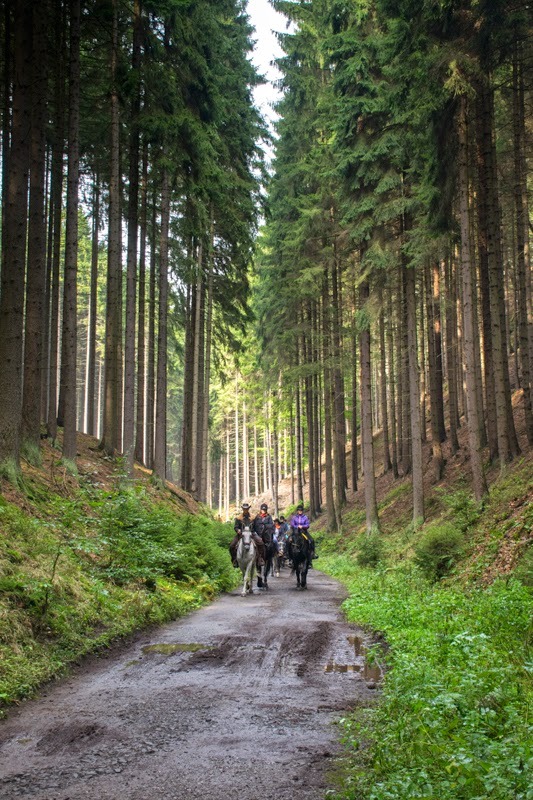 Riders disappearing into the forest. 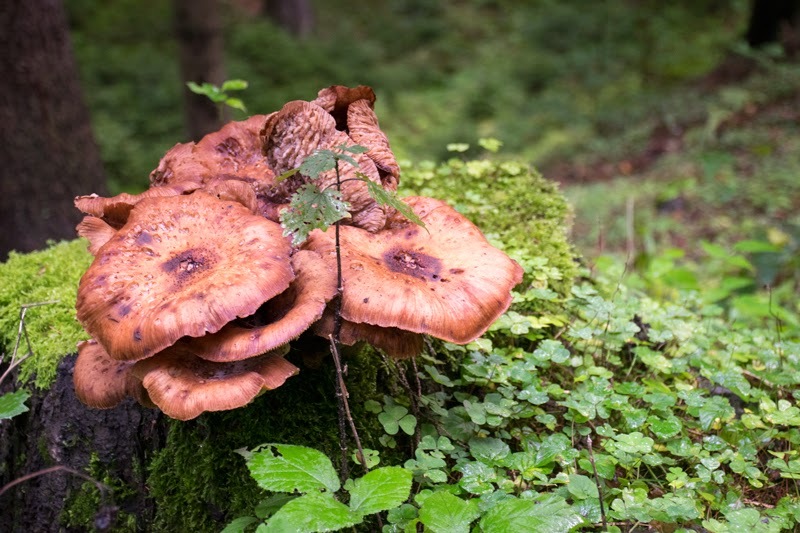 Another example of the many kinds of mushrooms lining the forest floor and clinging to the trees. Looking back down the trail. 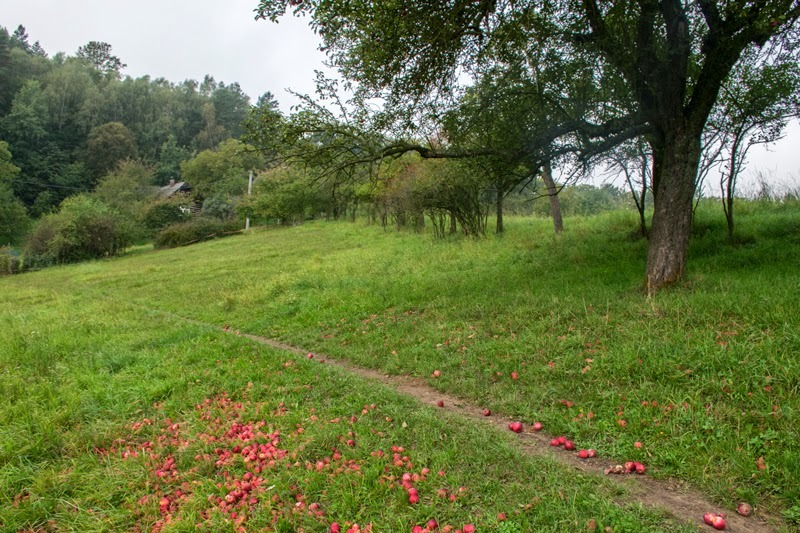 I followed the hoof marks to Hruba Skala. 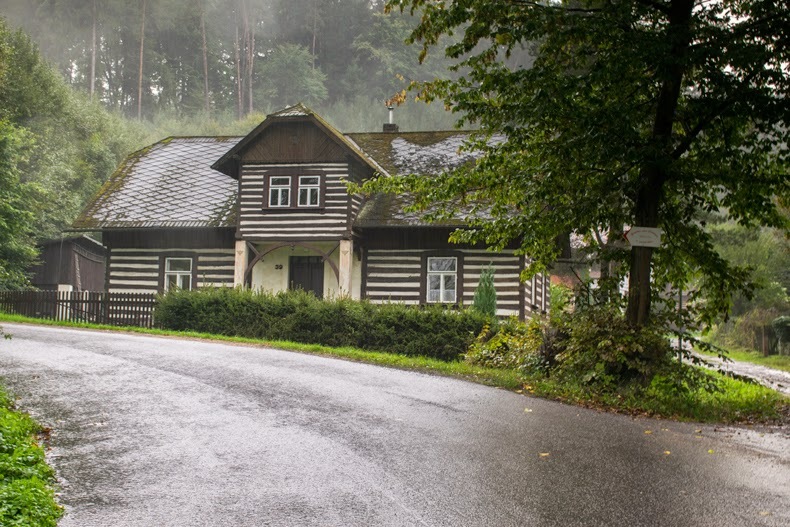 Eventually I made it to Hruba Skala as the sky began to turn dark. I think I'd come at least nine kilometers. 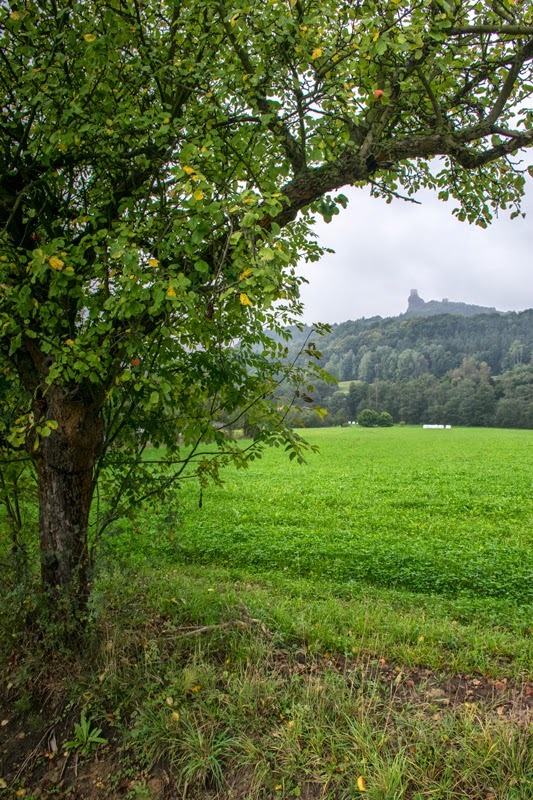 I marveled at the first glimpses the castle afforded me of the great sandstone formations of the Hruboskalsko rock town, which was supposed to be where I walked to next. I had some very good tea and some cauliflower soup sitting outside under an umbrella when the sky betrayed every hiker in the region. It thundered and it poured. 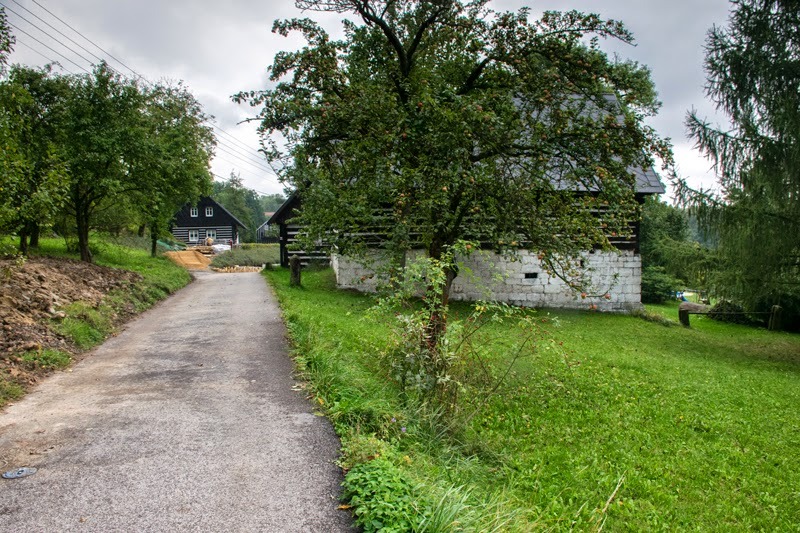 And that's when I made the decision to walk down through the village of Doubravice to the Hruba Skala train station (really just a tiny building with one bench) and go back to Jicin. The rain wasn't going to go away. 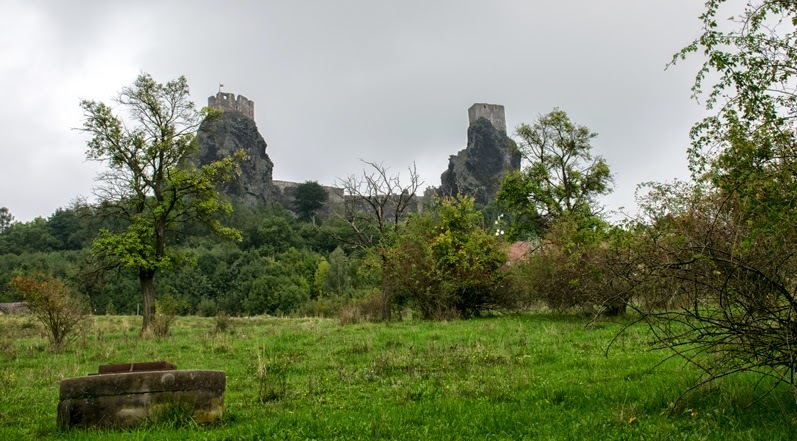 The amazing rocks of Hruba Skala and Valdstejn Castle would have to wait for another trip. And I'd hike the other direction the next time. Start in Turnov and end at Trosky. Coming down to Trosky to Ktova seems to be a lot easier than hiking up from Ktova to Trosky. As the train chugged back to Jicin Roe Deer, Red Deer, and hare bolted across the surrounding fields. 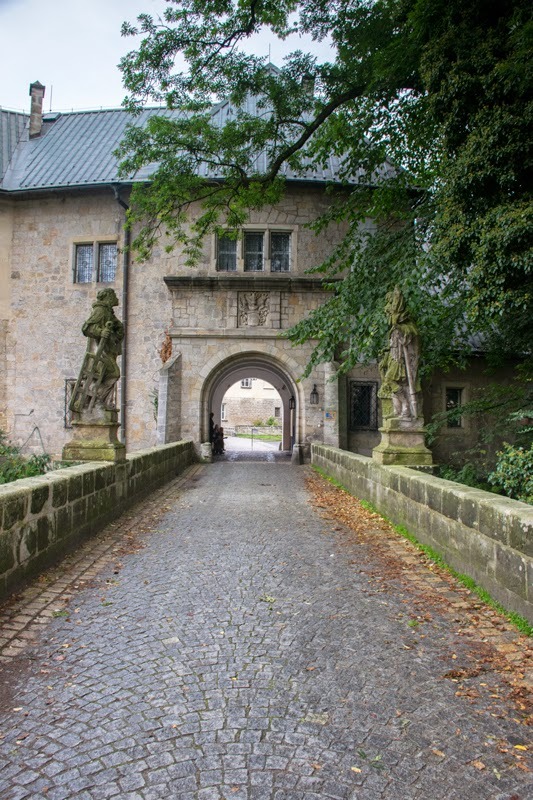 Entrance gate to Hruba Skala. Hruba Skala, and the rocks of the Hruba Skala rock town poking up above the trees. They are many, many meters high. Hruba Skala rock town under a threatening sky. 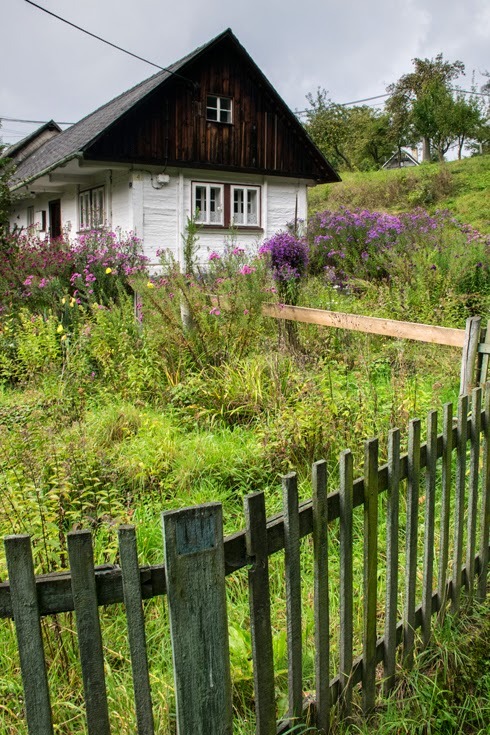 Traditional wooden house in Doubravice. Taken in the middle of a down pour. 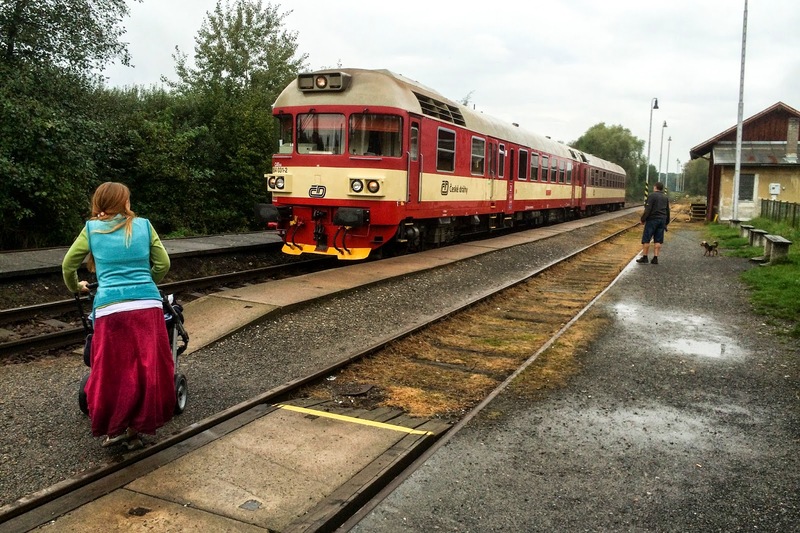 The train to Jicin arriving. 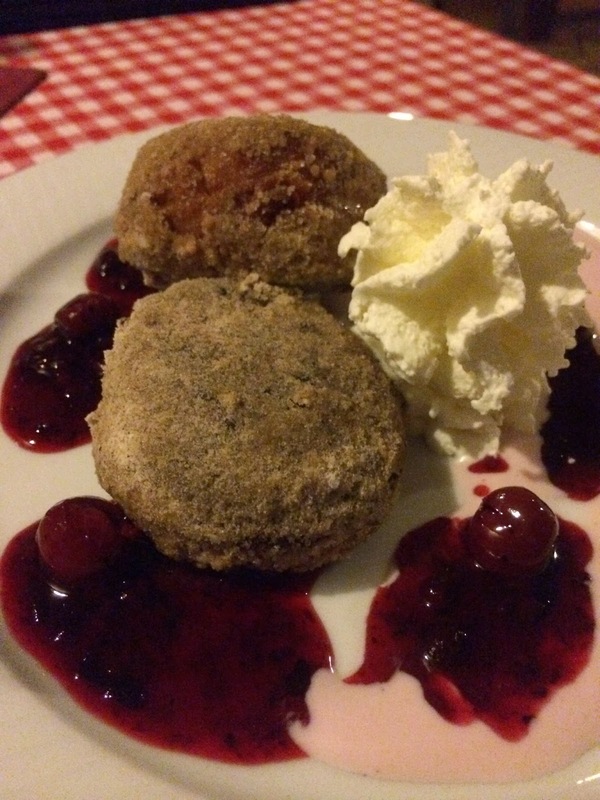 Back at U vsech certu in Jicin, I had more amazing mushroom soup, some salad, a mug of Kofola, and the most amazing thing ever: fried curd balls. They are like donuty, pancakey goodness covered with whipped cream various berries. This was one of the best things I ate in the Czech Republic.